A sofa table is designed for one primary purpose and that is to stand behind a sofa in a large interior space. They are frequently found in fashionable living rooms and provide an area for decorative items such as floral arrangements, sculptures and picture frames to be situated. If you’re looking for a contemporary table of this type which is not made from the standard wood designs then cast your eyes over this stunning glass-top Clayton sofa table with beautifully curving chrome legs. It’s rather futuristic in style and can certainly be called ultra-modern. The reflective quality of the rounded chrome legs spills out into the rest of the room and the glass top brings a much desired lightness, in both senses of the word. The table top surface is relatively small compared to traditional designs but there is enough area to place contemporary statues, a collection of books, some glassware and other bits and pieces you may need close to hand. The Clayton Sofa Table is sturdy and secure and will look great with a variety of sofa styles. Sofa tables of all kinds have actually been in existence for quite a few centuries and it’s believed it was during the 17th Century when they began to become widely popular. As was the case in the past, the table situated behind the sofa was an ideal location on which to prepare drinks for family, friends and guests. Nowadays, they also double as places on which to leave television remote controls, movie magazines and an assortment of other reading material. However, which such a stylish appearance as seen with this sofa table with curving chrome legs, the placement of decorative items and attractive objects of sentimental value are probably more appropriate. It’s going to be very much an accent furniture piece as well as a functional one. 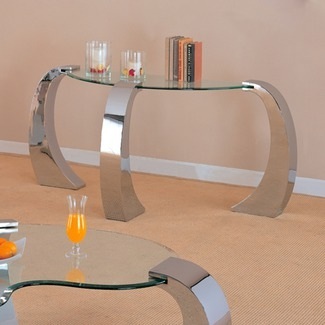 You can buy it from here: Wildon Home Clayton Sofa Table in Chrome. Dimensions: 28.875″ H x 64.75″ W x 45″ D.
Are you so addicted to Facebook that the first thing you do upon waking in the morning is rush to see what’s new in your Facebook wall? Although most people won’t admit to it, more and more people are becoming addicted and indeed dependent on the famous social networking site created by Mark Zuckerberg. 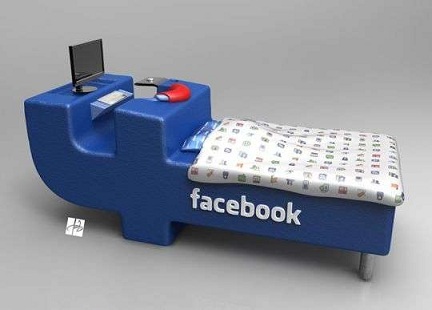 If you are one of these people then the Facebook logo-shaped bed and computer desk all-in-one furniture design concept will be something to “Like”. If and when created, the FBed will provide a furniture treat for social networking addicts. The iconic “F” is known worldwide and is instantly recognisable when seen in the picture above. The main body of the toppled-over “F” is where the person sleeps whilst the upper portion is to be made into a computer desk and seat. When you wake up, you only have to walk a couple of steps and you’re ready to sign-in and begin updating your followers about the strange dreams you had, who you slept with and how comfortable it was sleeping in the FBed. Whether anyone will care, at least concerning the first two points, is another matter. One symptom of too much computer use is insomnia. Unfortunately, this FBed might contribute further to sleepless nights, migraines and unsocial attitudes the next day. However, it is rather an interesting design and will be a fantastic decorative addition to a young person’s room, regardless of how long they spend on the internet each day. The famous logo and the unique design mean it will be a popular piece of furniture for many of the more modern generation. Put a photo of you sleeping on the FBed on Facebook and you’ll likely get a lot of approving votes of confidence in the form of “Likes”. Bookmark the website of Croatian designer Tomislav Zvonari? for further updates as to when (if) it will be available for purchase. See here: DevianTom. Some of my favourite furniture is created using objects and materials that have previously been used in a different context. For example, using old house bricks to form the columns of a bookshelf or the creation of an armchair made entirely from what was once a Renault car. 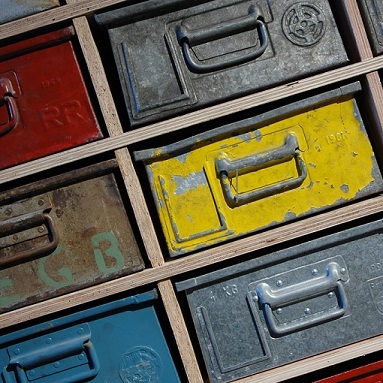 Then of course there is something like this delightful looking cupboard, as seen in the pictures below, which is composed of old industrial zinc boxes once used for storing mechanical tools and parts. The ‘Cupboard’ features metal drawers within a wooden shelf framework. 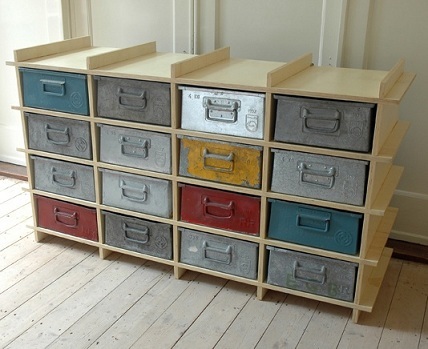 The drawers come in a variety of colors, some seemingly painted. The wood differs from one set to another, with some cupboards in dark wood and others in light wood. With so many beautiful colors and attractive wood frames, the cupboards are sure to find a home in most styles of interior décor and room sizes. At the time of writing, the cupboards are in the prototype stage, which actually allows us to more easily imagine the many potential styles the cupboards could be made in. The minds behind the design are creative Dutch duo Nathan Wierink and Tineke Beunders who together form ‘Ontwerpduo’. Based in Eindhoven, the two designers share an old factory hall studio with ten other designers who each have a partitioned studio in the huge space. You can see more of their work as well as follow their progress on their website found here: Ontwerpduo Design. Combining Chinese and Japanese designs, this Kwan Yin (Guanyin) shoji screen is a delightful mesh of two very ancient cultures. The screen acts in much the same way as a conventional room divider and is composed of three panels which can be folded inwards or outwards to create an eye-catching decorative feature. Perfect for an interior with a decidedly Eastern décor scheme, the image of the Chinese ‘Goddess of Mercy’ will bring a compassion-inducing ambiance to a room. Kwan Yin (known in China as Guanyin) is a well-known character in Buddhism and is considered a bodhisattva, which is an enlightened being. In more recent Chinese mythology she is also seen as a goddess of compassion and mercy. Originally depicted, long ago, as a male figure, the gender of the Buddhist character changed over time and now most frequently resembles a female seated in a meditative position. In the image on the shoji screen, Kwan Yin is holding a lotus flower although in other representations she if often seen with a water bowl or fish basket in her hands. 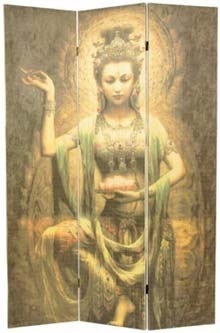 Knowledge of Guanyin also reached the shores of Japan, as did Buddhism as a whole, via Korea. It is thus not such a surprise to see a Japanese item of furniture decorated with a Chinese theme. To this day, Kwan Yin is highly regarded and much loved across China and she is seen as a goddess of unconditional love, compassion and mercy. Made from matchstick bamboo, the pictured shoji screen (which were traditionally used as partitions in classical Japanese homes), will create an interesting and attractive feature in a living room or bedroom setting. It can be used to hide more unsightly areas of an interior or be used to dress behind in a shared bedroom. In a room where guests congregate, the Guanyin screen will likely inspire conversations and discussions about philosophy, history and travels. 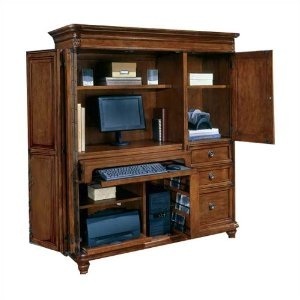 This computer armoire is an attractive, functional and very efficient item of furniture for the placement of home computers and related electrical equipment. Its appearance is similar to that of a traditional wardrobe but when opened up, it reveals storage areas and surfaces where computers, keyboards, printers and scanners can be situated with comfort and ease. Copious amounts of drawer space allow for the storage of documents, cables and software at arm’s reach. Made from hardwoods and cherry wood veneers, this particular computer armoire is perfect for a room which needs a bold, confident and traditional item of furniture to match similar styled pieces that may already be present. Many people have their computer station in the main living room but complain that a computer desk is not a suitable decorative feature in this type of interior. The wooden armoire on the other hand, which is comfortable to sit at, is ideal and will look great in various living room interior design schemes, without taking up too much extra space. The armoire comes with doors fitted so that the computer and other items within can be hidden from view when guests visit as well as being kept free from dust when not in use. A retractable keyboard shelf at a comfortable height can be drawn in or out depending on circumstances. There are enough compartments for most computer accessories to be placed including printers, gaming consoles and speakers. The armoire in many ways combines the classical furniture style of the previous couple of centuries with the modern computer age and the designs associated with exciting electronic developments. It’s certainly going to be a positive new design element in a living room, dining room, bedroom or home office. Includes a CPU compartment with CD rack.